Until I was ten or eleven I had to share a bedroom with my younger brother. We were sent to bed at the same time, which meant he got to stay up later than I had at his age and I had to go sooner than I thought I should. Not only that, but bedrooms were bedrooms in those days, and bed meant bed: curtains drawn, lights out, no entertainments, no talking or even books. Beds were for sleeping. It was not even dark in summer. We could hear Timmy from next door-but-one bumping along the pavement on his trolley, made from a long board and some old pram wheels. We were in bed but he was still playing out at ten o’clock at night. That was really unfair. He was two years younger than me. Downstairs we could hear the next-door neighbour talking with our parents. She sounded like a duck, as did her name. “Mrs. Quackworth,” I quacked in my best duck voice. “Mrs. Ackworth,” Martin corrected me. “Mrs. Ackworth,” he said more loudly. “MRS. ACKWORTH” he yelled, lengthening each syllable as he shouted. “Shut up and go to sleep,” mother shouted up the stairs. “That boy’s spoilt!” Mrs. Ackworth said. The ball rattled against the fence, thudded into her French windows, bounced across her garden and flattened her plants. We climbed over her rockery and ran across the lawn to retrieve it leaving a trail of dislodged stones and scuff marks. We had muck-chucking battles with Timmy whose house was the other side of hers, depositing debris and detritus across her path. She rarely complained as she swept it up. One day we used blackberries as ammunition, stolen from the allotments near the railway, too bitter to eat. Most went astray, leaving lasting purple stains on her green shed. Stray brambles grew around her garden for some years afterwards. I was six when we moved in next door. Mrs. Ackworth seemed ancient, but she would still have been only in her fifties. 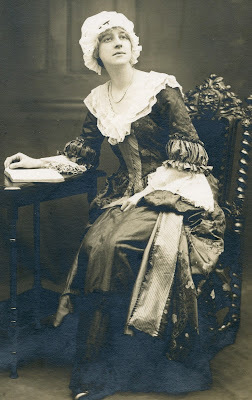 She had a deep, cultured, musical voice which had for several years gained her leading contralto parts with the local operatic society, although it had since been ruined by smoking – giving a duck sound. In her day, she had sung all around Yorkshire. Newspapers had said she was one of the best contraltos in the county. She listened to classical music on the wireless, talked about opera and the arts, and helped with the local Conservatives. The effect was formidable. She was always “Mrs. Ackworth”, never “Ethel”. People thought her fearsome. Despite more than a twenty year age difference, she struck up a close friendship with our mother who had the knack of taking people as she found them. Mrs. Ackworth had lived there the thirty years since her marriage, but her husband had died just a few months later leaving her with little means of support. Male admirers quickly gathered to help, admirers of her voice you understand, especially a wealthy property owner, himself married and twenty-eight years her senior, who set her up with a small milliners shop. She had been at school with his eldest daughter. It was said that during the nineteen thirties, when cars were rare, there would be only one in the street, her benefactor’s car, parked late at night outside her house. There were rumours they had toured Europe together. When he died he left her a considerable sum of money but his family somehow managed to deprive her of it. Mrs. Ackworth used to watch us from the kitchen window as we played in the garden. It felt intrusive, but I know now she was thinking about the children she never had. She was distraught when we moved again after a decade or so, but we kept in touch through the years, through the inevitable succession of marriages, births and deaths. In effect, she became a surrogate grandma. “You’d better go see Mrs. Ackworth,” my brother and I were told when we were home, and so we did, to sit and be criticised beside her coal fire and look out through her French windows at the rockery, lawn and shed. Later, we took our wives, and then our children. The house still had all the original nineteen-twenties fixtures, with kitchen cupboards and fireplaces with grained paintwork. Her furniture was of the same period too, or older. Her face brightened like the sun on seeing she had visitors. “Mrs. Quackworth,” the children would say. The house smelled of cigarettes and boiled rabbit, and she always had a bottle of sherry on the go on the sideboard. Age made her more and more outspoken. We used to say we went to be insulted. “Your father says he’s going to give up smoking. I can’t see why. He’s not a smoker. One or two a day doesn’t count.” She considered herself a proper smoker: one or two packets a day. She stayed active into her nineties, making the coal fire in the mornings, trudging to the supermarket for shopping and carrying home her heavy bottles. We were beginning to think she would outlive us all. When the time eventually came and her will was found there was a surprise in store. Although it was not worth anything like as much as she might have imagined, and a fifth of what it would fetch today, my brother and I were astonished to discover she had left us the house. For just a few weeks, the open fireplaces, grained paintwork, French windows, green shed, rockery and garden belonged to us. I swear if we had looked carefully enough, we could have found stray brambles still growing in the dark corners. Some months later, my father bumped into Timmy’s parents shopping in town. My father struggled to hold his tongue. Yet again, England are out of the World Cup, eliminated by a tactical master class from Croatia that revealed the wobbly defence and ineffectual attack hinted at in previous games, overshadowed by goals from set-pieces. The team did well to get to the semi-final, and should get better as they get older, but it seemed unrealistic to expect they would win it this time. 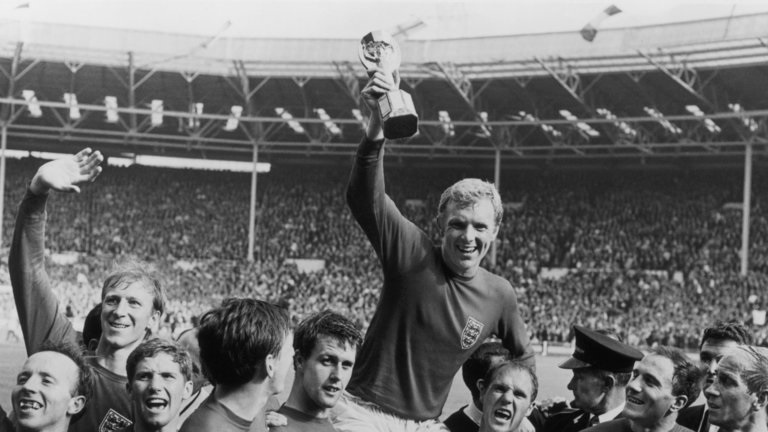 So we have to wait at least another four years for another chance to repeat the glories of the 30th July, 1966. This time was quite reminiscent of 1966. Like now, the north of England at least had seen some warm, dry, sunny days, although not as dry as this year, and everyone was behind the team. I watched it on television with a few friends. It was a Saturday afternoon. Our Belgian foreign-language exchange pen-friends were staying and Hugo was cheering for West Germany. When they scored first we had to expel him from the room. He went upstairs to listen on the transistor radio. England then scored twice to take the lead, and we would probably have allowed him back in had he wanted, but he stayed upstairs until, one minute from the end, the Germans equalised and he came down mocking and taunting, and was immediately banished again. The rest is history. The match went to extra time, and England scored twice and won. 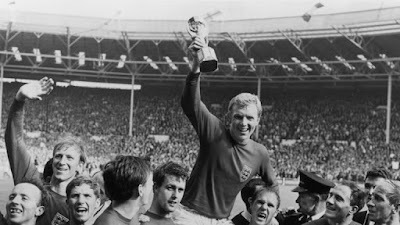 Not only can I remember watching it, I can still list the whole of the winning team: Gordon Banks in goal, full-backs George Cohen and Ray Wilson, half-backs Nobby Stiles, Jack Charlton and captain Bobby Moore, forwards Alan Ball, Geoff Hurst, Roger Hunt, Martin Peters and Bobby Charlton. I asked someone of similar age to me whether he could still name them all, and he did so without difficulty: Englishmen of a certain age with shared memories. Sadly, some members of the team still living remember nothing of it at all because of football-induced head trauma. Was it really fifty-two years ago? Am I old? In those days anyone whose memory reached back that amount of time, say back to the First World War, really did seem old. I hope that’s no longer true. This time, England will now play Belgium in the third-place play-off. I suspect the Belgians will win; they are far too good for us at the moment. I wonder what Hugo is thinking, and if he remembers where he was in 1966.